On March 1 Donald Trump announced that his Administration would implement a 25% tariff on all steel imports and a 10% duty on aluminum. President Trump initially said the tariffs would apply to all steel and aluminum exporters but a week later, facing pressure from Republican free-traders, temporarily excluded Mexico and Canada while NAFTA talks continue. The announcement caused an immediate drop in stock markets and a chorus of outcries from US trading partners, who said they would impose retaliatory tariffs on American exports and fight the trade restrictions at the World Trade Organization. But they shouldn't have been surprised. During the election campaign Trump blasted China for a host of American economic ills including an artificially low exchange rate, dumping steel into the US market, and funnelling billions of dollars in subsidies to its steel mills. Chinese steel companies, which produce half of the world's steel, have long been a target of US import duties, and the 25% tariff was clearly aimed at them. There are currently 169 antidumping and countervailing duty orders on steel, with 29 of them against China. 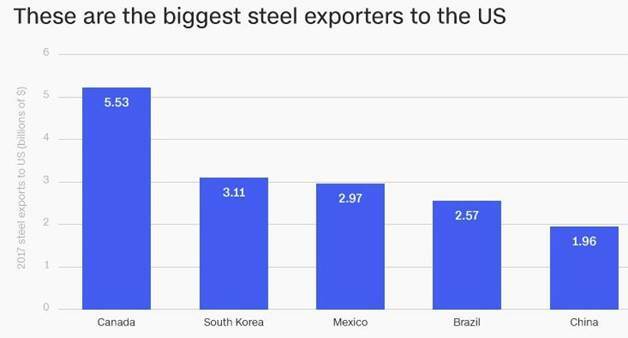 The largest exporter of steel to the US is Canada at around 17% of the total, or 5.5 billion tonnes in 2017, followed by South Korea, Mexico and Brazil. China exported 1.9 billion tonnes, although this number may be much higher, considering that China often flouts trade rules by sending steel and aluminum to the US through third countries. Michael Stumo, CEO of the Coalition for a Prosperous America, points out in an op-ed that “While the United States once pioneered the world’s steel industry, it is now the largest importer of steel, importing nearly four times as much as its exports.” Stumo notes that the glut of steel being churned out by China has caused the loss of 50,000 US jobs since 2000, closed a number of key steel-making plants, and decimated steel used in electrical transformers where only one US producer remains. The effects of the tariffs on the US economy and its trading partners are the subject of considerable debate right now, but to examine why Trump is doing it, we have to go beyond the economic headlines. In doing so, we find that the protection of steel and aluminum, and the recent, long-overdue call for the domestic production of 35 strategic metals, is part of a greater plan to build up the American military to counter increasing threats from two historical adversaries: Russia and China. Trump is 100% correct. Although he could have taken it one step further, and said without steel, you don't have a military. The Commerce Department has said the current US dependence on steel imports puts the country in a position where it would be unable to meet demands for national defense and critical industries in a national emergency. It would not have the legal authority to commandeer supplies, as it could within the US, points out Lawrence Solomon in an excellent piece from the National Post. In it, Solomon notes that during the Korean War President Harry Truman seized the US steel industry to maintain production for the war effort, and during World War II, citizens were asked to donate their automobile bumpers to make scrap steel. The first step in such a confrontation is a trade war. Zero Hedge sets out the conditions that are right now ripe for an economic war between the United States and its trading partners. Author Tyler Durden put together a collection of charts that include a rise in populism (covered in our last article) leading to a movement against globalization and towards nationalism (often accompanied with protectionism), rising income/ wealth inequality, and the growing number of displaced persons, putting pressure on countries to absorb immigrants and adding to social tensions. Project Syndicate points out that, apart from slowing the flood of Chinese subsidized steel and aluminum finding its way into the United States at low prices, the tariffs put pressure on China to stop requiring US companies to transfer their technology to Chinese firms as a condition of market entry. The Americans see this as a form of extortion and the tariffs are a way to persuade China to abandon technology transfers, thereby stopping the theft of US technology and intellectual property. The stealing has mostly been done by the People's Liberation Army (PLA) which has sophisticated cyber-espionage capabilities. Other measures to prevent intellectual property theft are reportedly being considered by the Office of the US Trade Representative. While many believe that world wars are consigned to the dust bin of history, Trump is clearly not one of them. 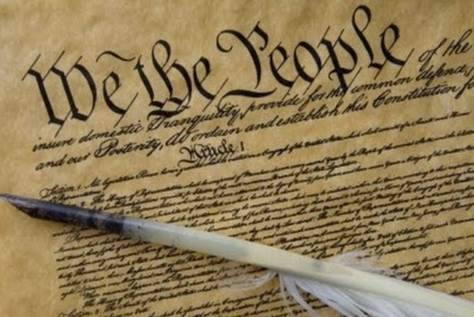 In fact a deeper reading of history shows that the Founding Fathers of the United States of America were focused squarely on the importance of maintaining a ready supply of materials necessary for the defense of the nation and war-making capabilities. Alexander Hamilton's Report on Manufactures, written in 1791, said “Every nation ought to endeavor to possess within itself all the essentials of national supply. These comprise the means of subsistence, habitat, clothing and defence.” This would be achieved by implementing moderate tariffs on imports which would be used to fund local industries, without decreasing supply or increasing prices. The goal of the subsidies was to make US companies, and the nation, competitive and independent. During the Irish potato famine of the 1840s the United Kingdom took the opposite approach, repealing the Corn Laws which protected the domestic food industry (including grain) by imposing tariffs on agricultural imports from its colonies – thus ushering in a period of free trade which Britain has held to ever since. In another column Buchanan noted that the US relied on tariffs to convert its agrarian economy into the world's greatest manufacturing power by 1900, an approach replicated by Bismarck's Germany in the 1870s and Japan in the 1980s. “There’s nothing in the world that we cannot produce here. And if it can be made in America, it should be made in America,” Buchanan concludes, echoing Trump's Make America Great Again mantra. Unfortunately globalization has completely turned the tide of economic history, so that now the United States is dependent on most materials necessary for the defense of its borders and projection of military force including steel, manganese, vanadium, chromium, lithium and until very recently, oil. The Founding Fathers would have been horrified at the currently weak situation the country finds itself in. The intent of the Monroe Doctrine was to free the newly independent colonies of Latin America from mostly Spain and Portugal, so that the States could exert its influence undisturbed. Now, the real influencer in Latin America is China. During the 19th century Great Britain and European nations carved Asia, Africa and the Caribbean into colonies or protectorates, with the British controlling India and North Africa, the French and Dutch in Indochina, and the Spanish in the Americas, the Caribbean and the Philippines. The onset of the Cold War and the dissolution of European empires in the 1950s split the world in two, with the USSR controlling the vassal states surrounding the Soviet empire and the United States defending Latin America and North Asia (Japan, South Korea). Flash points like the Vietnam War occurred in places where these spheres of influence collided, but it was always clear who the enemy was. Today we are not so sure. Is the new foe China, which is becoming increasingly aggressive both economically and militarily, Russia, whose persistent meddling (Eg. the US election, the Crimea, and most recently, a chemical attack on British soil) keeps the US in a state of perennial confusion, or ISIS? It appears that spheres of influence have been eclipsed by globalism, with Russia, China and the US each competing to control the most territory and resources in a world dominated by multi-lateralism and free trade. We are in a power vacuum, as multi-national bodies like the UN and NATO look increasingly incompetent in preventing atrocities like Syria or nuclear threats from places like Iran and North Korea. If we had to pick two adversaries that the US needs to prepare a strong military response for though, they would be China and Russia. The headlines are full of news about the chemical attack on a former Russian spy and his daughter in Salisbury, England. British officials say Russia was responsible for using a military-grade nerve agent to poison the pair – a charge the Kremlin denies. German Chancellor Angela Merkel and UK Prime Minister Teresa May have agreed to counter Russian aggression and the US will back Britain if the situation escalates. Twenty-three Russian diplomats have been expelled. The attack is particularly alarming since it's the first use of a nerve agent on Alliance territory since NATO's formation; demands are being made of Russia to disclose its stockpile of chemical weapons. The incident is the latest in a series of attempts by Russia to exert its power in a world bereft of clear battle lines. Examples include the annexation of Crimea in the Ukraine, military support of Syrian dictator Bashar Al Assad, and Russian meddling in the US Presidential election through Internet trolls. On Thursday the US slapped Russia with sanctions for the alleged election interference and cyber-attacks on US companies. In Syria a UN ceasefire continues to be ignored and on Tuesday the Russian military threatened action against the United States if it strikes Damascus. Trump's steel and aluminum tariffs are an economic response to the Chinese threat but conflict between the two superpowers has over the years spilled into the military realm. China has been involved in territorial disputes with Japan and Taiwan over the Senkaku islands, and Vietnam over the Spratly islands. China has also ramped up its naval presence in the South China Sea. Why? China is energy-starved and the areas off the coast of the Philippine province of Palawan are oil rich. In mid-2012, the Philippines and China came dangerously close to an armed conflict over the Scarborough Shoal in the South China Sea. China's increasingly contentious showdown with Japan in the East China Sea could prove to be even more dangerous. At issue are disputed Islands (Senkakus to the Japanese, Diaoyu to China) and the fishing rights and natural resources those islands would deliver to their owner. The standoff has already resulted in several direct confrontations between China and Japan. The US has treaty obligations to Japan. President Obama's Secretary of Defense Chuck Hagel warned China that any attack on the disputed islands would "fall under our security obligations." Obama's “pivot to Asia” was designed to curb Chinese territorial ambitions which include the reunification of Taiwan with China – a hornet's nest that Trump walked into when he accepted a phone call from Taiwanese President Tsai Ing-wen soon after inauguration. But the pivot, to be realized through increased trade like the Trans Pacific Partnership and increasing its regional military profile, has been a failure. The US could not prevent China from building islands and annexing 80% of the South China Sea, stop China-backed North Korea from conducting nuclear tests, or defend freedom of navigation through the $5-trillion annual trade corridor. On assuming power Trump pulled the US out of the TPP and began a dangerous war of words with North Korea’s Kim Jong-un as the reclusive nation successfully tested its first intercontinental ballistic missile capable of hitting the US mainland. Meanwhile China continues to expand its military. In early March it was reported that China plans to boost military spending by 8.1% in 2018, compared to a 7% increase in 2017. While 2016 spending of $215 billion is about a third of that spent by the US in the same year - $611 billion – a modernization drive has accelerated in recent months. Developments include the PLA launching its first aircraft carrier, the opening of China's first military base in Djibouti, a new J20 stealth fighter, and most worrying, the Dongfeng-41 intercontinental ballistic missile capable of carrying nuclear warheads. Last summer while celebrating the 90th anniversary of the PLA, Chinese President Xi Jinping boasted that China is now capable of vanquishing all invading enemies. China has the largest ground forces in the world, bigger than those of the United States. Separate Chinese and Russian aggression is overt, but the two countries have also begun cooperating in more subtle ways, one wonders if an attempt to join forces to throw the United States off base and assert global power is underway. Of course Russia and China have since 1950 agreed to defend one another against an attack from US-backed Japan or its allies (China backed North Vietnam and North Korea) so continued cooperation is unsurprising. In 2001 Russia's Vladimir Putin and then-Chinese President Jiang Zemin signed a 20-year agreement to “increase trust between their militaries” . The two countries now regularly participate in joint maneuvers including joint naval exercises to counter US influence in the Asia Pacific region. Economic ties are also growing closer. On New Year's Day a second Sino-Russian oil pipeline began operating, doubling the amount of Russian crude being shipped to China, while in 2014 Beijing and Moscow signed a 30-year, $400-billion deal for Gazprom to deliver gas to China. The latest evidence of Chinese-Russian business ties involves the launch of a crude oil futures contract, priced in Chinese yuan and convertible into gold. The contract will allow oil exporters like Russia and Iran to dodge US sanctions against their countries by trading oil in yuan rather than US dollars. In World War I severe material shortages (tungsten, tin, chromite, optical-grade glass, and manila fiber for ropes) played havoc with production schedules and caused lengthy delays in implementing programs. This led to development of the Harbord List – a list of 42 materials deemed critical to the military. The NDS was intended for all essential civilian and military uses in times of emergencies. Guerrilla warfare in Zaire during the 1970s caused the worldwide price of cobalt to increase from $6 to $45 a pound, and a UN trade boycott of Zimbabwe stopped legal exports of chromium from the country. In 1992, Congress directed that the bulk of these stored commodities be sold. Revenues from the sales went to the Treasury General Fund and a variety of defense programs - the Foreign Military Sales program, military personnel benefits, and the buyback of broadband frequencies for military use. Since then, a variety of factors I've covered before, including restrictive environmental regulations and a sharp decline in US mining investment, has made the United States dependent on foreign mines for a number of strategic metals – a situation I have dubbed “A Nation's Metallurgical Achilles Heel”. If Trump is in fact bolstering the US Military by rebuilding the US steel industry and allowing for a greater projection of American war-making prowess, what materials would be necessary for the country to have? By no means exhaustive, the list below would be a good start. Manganese - Aside from iron, manganese is the most essential mineral in the production of steel. You can’t produce steel without adding 10 to 20 pounds of manganese per ton of iron. The US has no Mn mines. Rare earths - There are numerous military applications of rare earths, everything from battle tanks, drones, lasers, radar, missile-guidance systems, satellites and aircraft electronics. In 2015 Mountain Pass, the only rare earths mine in the US, went bankrupt and in 2017 it was sold to a Chinese-led consortium for $20.5 million. Lithium - Lithium batteries are recognized as the perfect battery for military equipment because they can be recharged from a variety of power sources, including portable solar panels. In 2015 the US Navy paid $81 million for the development of an energy storage system that can power an “electromagnetic railgun”, which uses electricity to hurl projectiles over long distances. More recently the US Army awarded a contract to supply a 24-volt 6T battery. The lithium-ion 6T versions are half the weight and pack twice the energy of traditional lead-acid 6Ts, which are used in 95% of tactical ground-vehicle platforms. Oil – You can't fight a war without oil, and while the United States under Trump appears to have become overly-dependent on shale oil, the resurgence of the US oil industry means that the States is considerably better off than just a few years ago when oil exports were still banned and the country was more dependent on foreign sources than currently. Still, the US imports around 6 million barrels of oil a day while producing close to 10 million bopd, meaning the country is unlikely to ever become oil-independent, as many sources are predicting. President Trump like Reagan before him is a nationalist who recognizes that the United States has bumbled into a situation of weakness and potentially dangerous dependence on foreign countries for critical materials necessary for the defense of the nation and the projection of military force. His steel and aluminum tariffs therefore make sense if the goal is to build up the American steel industry while at the same time subtly attacking a longstanding trade irritant and growing military threat: China. The current drive to overtake Russia in oil production might also be seen as a geopolitical strategy to counter Russian aggression by beating them at their own game. After years of neglect from previous administrations, the Trump White House finally understands that the United States needs to pump more money into domestic mineral exploration especially key commodities needed for military applications and the new electrified economy. If we go back to the Founding Fathers, the goal of tariffs is not to punish trading partners (though in our globalized world this is the inevitable reaction), but to make the nation more competitive and independent. If tariffs serve to strengthen US mining then they will have served their purpose, but there are more direct ways for governments to encourage mining, such as the rolling back of over-regulation (something Trump has already done through limiting the powers of the EPA), providing tax incentives for mining, and streamlining leasing and permitting of new mines. Becoming aware of what Trump is doing to encourage domestic mineral production puts resource investors one step ahead of the herd as the US becomes more pro-mining in its efforts to improve security of metals supply. I'm keeping a close eye on what boosting domestic output of critical minerals and reducing import reliance on them really means. I’m got a handful of the resource companies set to supply the US on my radar screen. Do you?